SuperHeroHype has a first look at a bonus features clip from Wolverine Anime, hitting DVD along with Blade Anime on Tuesday, July 31st. You can check out the clip below! 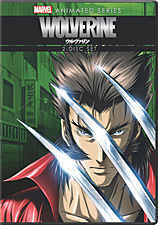 Both Wolverine Anime and Blade Anime are guided by New York Times best-selling author Warren Ellis (Iron Man: Extremis, Astonishing X-Men: Xenogenesis). Wolverine Anime stars Milo Ventimiglia (“Heroes”) voicing the title character of Wolverine. The three new featurettes on this two-disc set include “The Marvel Anime Universe: Wolverine Reborn,” providing insights into the process for creating the series. “The Ferocious Anti-Hero: Wolverine Defined” explores the hero’s character, and “Wolverine Meets X-Men” contains an interview with the creators of the Marvel anime Wolverine and X-Men. In the series, the love of Logan’s life, Mariko Yashida, is taken back to Japan by her father Shingen, a notorious crime lord. Once in Japan, she is forcibly betrothed to Kurohagi, a cruel criminal associate of her father, to solidify their business interests. Logan is determined to get her back, yet is plunged into a tangled web of corruption and violence at every turn. But with the help of young assassin Yukio, he just might manage to claw his way through the criminal underworld to confront Shingen and save Mariko.